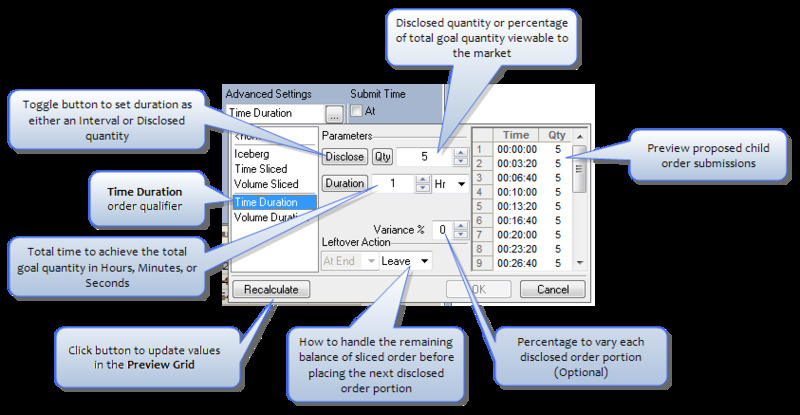 X_TRADER provides two duration parameters that can be used with Time Sliced and Volume Sliced orders: Time Duration and Volume Duration. A Time Duration order defines the total time desired to achieve the total goal quantity. You may set either the total time or specific begin and end times. 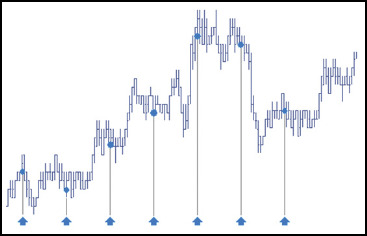 When specific begin and end times are entered, X_TRADER calculates the difference between the two to determine the total time duration for the order. Child order portions are submitted during the specified time duration to achieve the total goal quantity. Time Duration parameters can be set as either a Time Interval or Disclose Quantity. 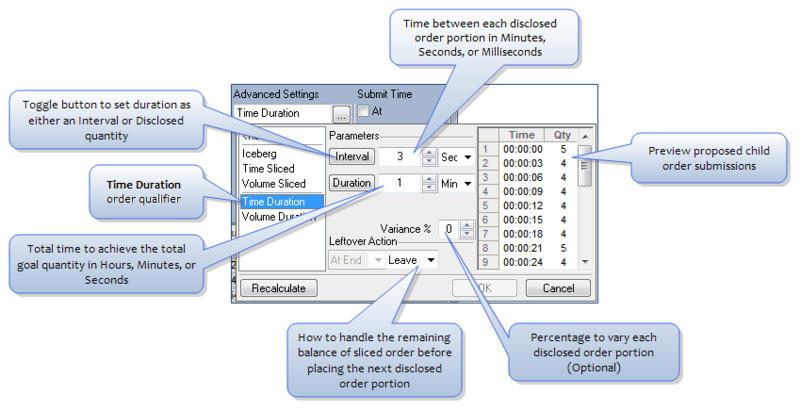 Interval (the default) sets the time between each disclosed order portion in Minutes, Seconds, or Milliseconds. The TT system calculates child order portions needed to achieve the total goal quantity in the specified time duration. Note: An invalid parameter warning displays if the number of slices calculated is greater than the order quantity. The following screen shot illustrates a Time Duration order with a goal quantity of 87, a time interval of three seconds, and a duration of one minute. The Preview Grid displays the proposed child order portions needed to achieve the total goal quantity in the one minute period. Disclose sets the disclosed quantity or percentage of total goal quantity viewable to the market and the time duration. The TT system calculates the interval between each child order portion required to achieve the total goal quantity in the specified time duration. The following screen shot illustrates a Time Duration order with a goal quantity of 87, a disclosed quantity of 5, beginning at 10:00 AM, and ending at 3:00 PM. The Preview Grid displays the proposed interval and child order portions needed to achieve the total goal quantity in the time period. Click the Advanced Settings drop-down and select Time Duration. Interval is the time between each disclosed order portion in Minutes, Seconds, or Milliseconds. Disclosed is either a percentage of total goal quantity or a fixed number viewable to the market. Note: Click the % button to toggle between Disclosed % and Qty. This is either the total time (Hours, Minutes, or Seconds) or a specific begin and end time. Note: Click the Duration button to display the Begin and Endfields. From MD Trader, select the Time Duration order configuration. Select the Time Duration configuration in the Order Type drop-down list.